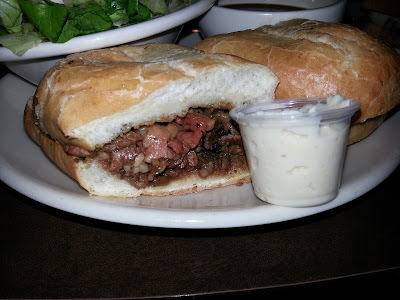 French Dip Reviews: 4 of 5 DeliciScore™ (Great) Awarded to Wedgwood Broiler for their Prime Rib Dip Sandwich in Seattle, WA on this 17th day of October, 2015 - Thanks, Tim! Solid choice. 4 of 5 DeliciScore™ (Great) Awarded to Wedgwood Broiler for their Prime Rib Dip Sandwich in Seattle, WA on this 17th day of October, 2015 - Thanks, Tim! Solid choice. I went to a party on a Saturday night about a month ago now for my good friend Greg's 40th birthday party. It was a great and fun night, keg and all. Yes, there was some drinking involved. While there, I ran into and struck up a conversation with my old buddy Tim S. Tim and I go way back and have had some fun times together at previous parties thrown by Greg. It was a lot of fun talking to and joking around with Tim. I was talking to him about my French dip reviewing and he asked me if I'd been to the Wedgwood Broiler (WB) yet for their French dip. He is a super big fan of the place and it sounds like he has a ton of history there. Since I hadn't been there before, in Tim's eyes this was very bad and I needed to go immediately. I felt it requisite to visit WB soon thereafter and give their French dip a full review. I went the next day. The review of this legendary Prime Rib Dip follows. I talked Jessica into running up to WB, which is about 20 minutes from our house. We pulled up on a nice, sunny, early Fall day about two hours before the Seahawks game started. Here's the WB from the parking lot. Nothing too fancy, pretty funky, but I was pumped. I entered first while Jessica walked the dog and got settled into the bar, which was mostly empty. 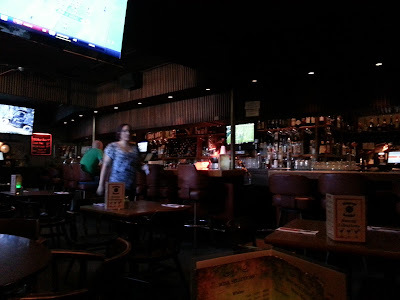 Here's a picture of the bar from my seat. It was super dark in there and really felt cave-like. But nice. It had a real 70's vibe to it, which I found comforting and nice. I ordered a bloody mary (two, actually). They were good and spicy, traditional. Nothing too fancy, save the dill bean which was tasty. 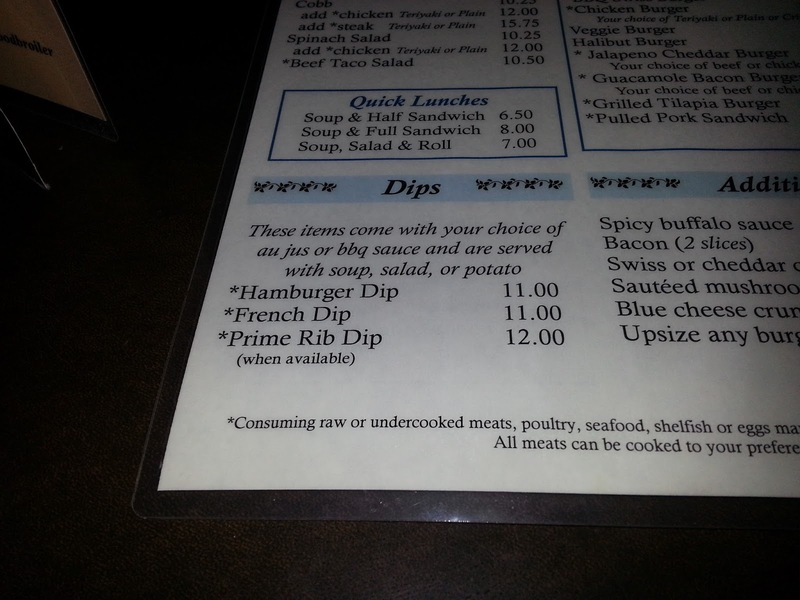 Drink in hand, I began poring through the menu and spotted the *section* with French dips on it. 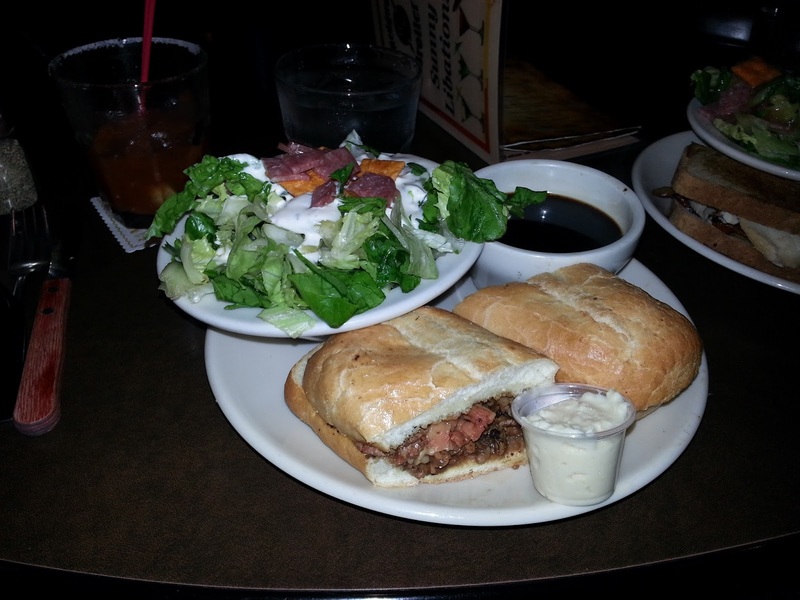 Not just the traditional, classic French dip, but also a Prime Rib dip (which is what I ordered) and a burger dip. I really am fond of burger dips. It might be true that I prefer the traditional roast beef French dip least of all of its brothers. The place has an old, funky 70's throwback feel but it feels very welcoming. The service was good and the waitresses were very nice. The bar was cozy and cave-like. 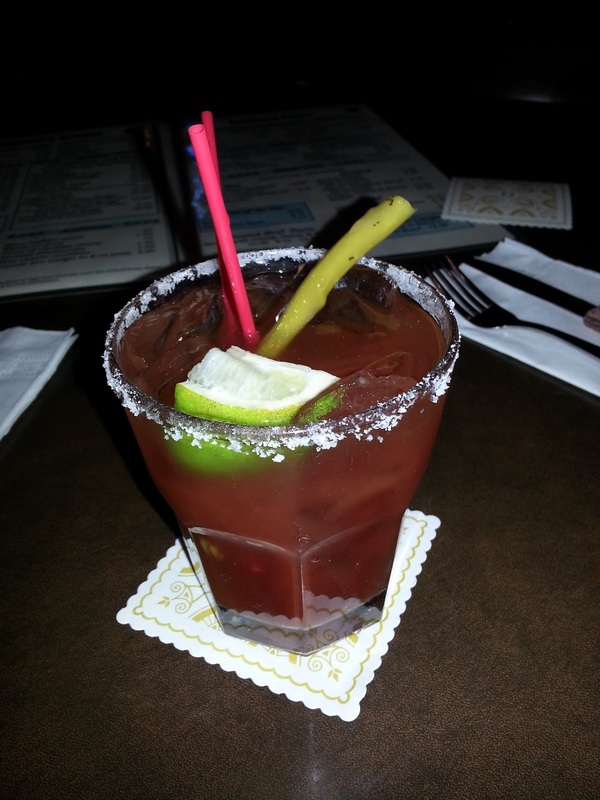 The bloody mary was very strong and served in a low glass. I was impressed when I ordered the Prime Rib Dip: you get to choose how fine you want your prime rib sliced and are asked if you want dressing on the side of the salad or tossed in. The Prime rib dip arrived. As we can see above, we got it with the side salad and the jus is extremely dark, which wound up being an absolute coup. The sandwich itself was average-sized but good. It came with a plastic cup of good (Beaver I believe) creamy horseradish. Just from the picture above, we can tell that this is not, per se, a gourmet French dip but it is a good one. Here's a closer shot of the sandwich itself. You can tell that it has standard bread and a good amount of beef. The beef was nice and supple. So I dove into the sandwich (first sans jus, then later with the jus). The jus was very (midnight) dark and it was really good. It wasn't too salty and had a deep, satisfying flavor. Because of its value and usability, it scores a 5 of 5. The sandwich itself was small and "classic" but that's fine. They don't have to be over the top to be great. As for the beef, it was good, soft and tasty but did not have an overly distinct beef flavor. There was also a little fat in there but I don't mind. That must means it is authentic prime rib. The creamy, spicy Beaver horseradish on the side was a hit with me this day and gave you that big nasal hit that is so fun. This meal also came with a salad that had very cold lettuce, which was a major plus. 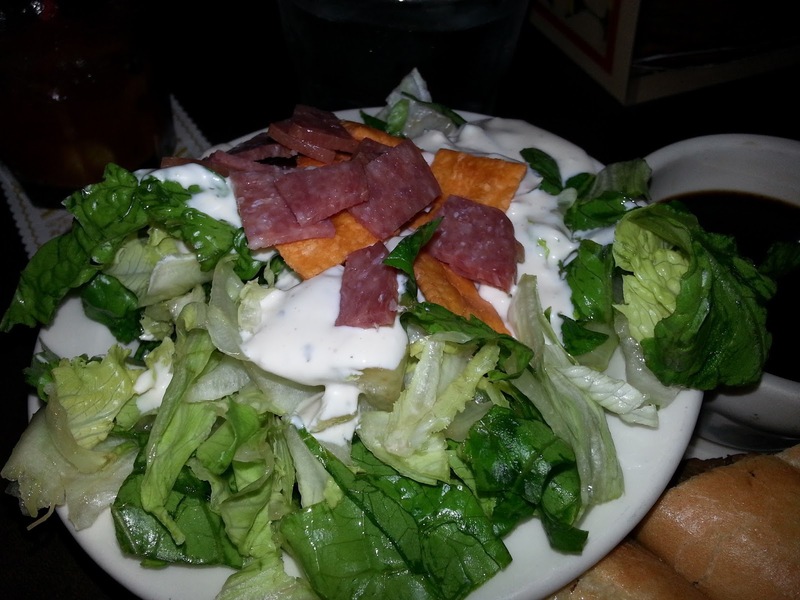 Tim had told me to get bacon bits on the salad and I forgot, which resulted in cheeze-its and salami, which is their default. It was a simple salad and there was evidence of other herbs on the simple salad, making it fancier than "just iceberg". Here's the salad, which was quite good. Cold lettuce goes a long way in my book. I score it a 4 for its creativity and value. Beirut no no no was playing on the radio. I got my French dip comfort food fix on a Sunday and two Bloody Mary's to straighten out my mood and outlook. 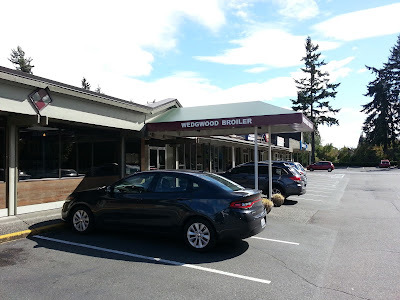 So circling back to the party at Greg's, I am greatful that I was introduced to Wedgwood Broiler from Tim and others. Tim takes this place seriously and I verified that their three French dip varieties and their Prime Rib Dip in particular are solid units. The place is cool, old, swanky and comfortable and I felt at home.